I talked about Sarkomand's Fault earlier here but the main thing to take away is that it was very largely sprung wholesale from my brain. By which I mean it was pretty darn close to being every cliche osr hexcrawl ever. Anyway the point is, I did all the work apart from a scant few one page dungeons scattered about. Spinning up Sarkomand's Fault took like 4 months of prep, pretty much, but I will say it was superbly easy to run- I had dungeons I knew, encounter tables I knew, it was great. Some of the further reaches were developed later, as players actually grew able and interested in reaching them, but for the most part wherever the players were, I was ready to whip something up. As for the player experience, exploration was exciting for them, because there was always something new over the horizon, and it was unfamiliar and (usually) ready to go. Inflexibility- Once you've created something and tied it to other things, it's hard to replace or erase things. The Wurderlands there are roughly russia sized. For comparison, Sarkomand's Fault was the size of Cuba. tl;dr I was way too ambitious in too short a period of prep time, and the theme was all over the place, it was a mess, AND I was using a very ill-conceived hack of the GLOG that I now shudder to look back upon. 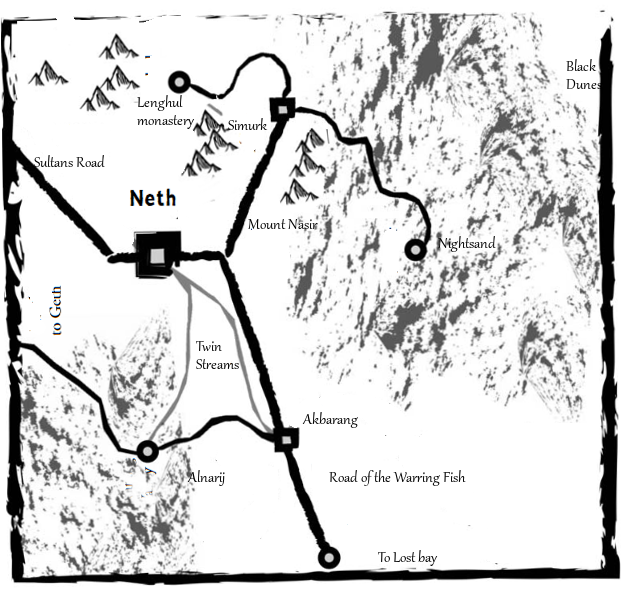 Anyway, the players chose Neth as their starting point, and this was directly after Sarkomand's fault, which was basically one long hexcrawl through an almost entirely ruined and monster-haunted wilderness. It was madness. Madness! Not only that, but players had side-characters in other realms- there was a subplot of a character from the last world mucking about in a feudal swamp with witches, moon cults, and siege warfare, and some players with really weird almost superheroic characters doing gothic detective investigations in Draculavania, in a very Batman-style adventures. It was amusing but the confusion and unfamiliarity didn't have proper support on my end for the players to find their feet. 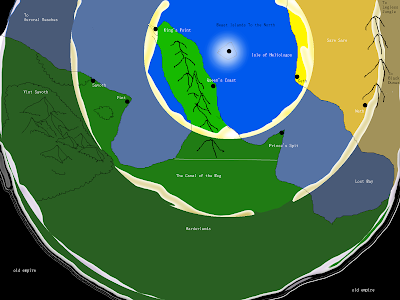 The other was a lack of an overarching goal- Sarkomand's Fault had 'Find the Orb of Omnipotence' as a sort of default any character could get behind. Wolf Moons had the bad sandbox problem of 'woah isn't this world cool guys you can do anything' without much context to apply to individual characters. This was the followup to Wolf Moons, where I appropriately went smaller-scale. The players were somewhere in Wolf Moons, technically, but I focused entirely on a starting town, nearby village, and interesting local environs, and left bigger picture concerns entirely offscreen as they weren't relevant. Also, I used procedural hex-crawl generation from Melancholies and Mirth to whip this place up. Those procedures have grown more detailed and usable via click of a html coded button since those caveman days of rolling real dice and consulting blog pages, but even so, it cut down on my prep time quite a bit. Additionally, I used a modified 1-page system of Into The Odd + Maze Rats. Finally, I focused on what really made Wolf Moons special- the system of day, night, and seasons all being randomly generated and based on Moons and one Sun rolling around the sky as well as mythical magical explanations rather than scientific ones, and the societal implications of this. All in all I think it worked pretty well, and this game crumbled due to schedules and players falling apart rather than any glaring setting issues. 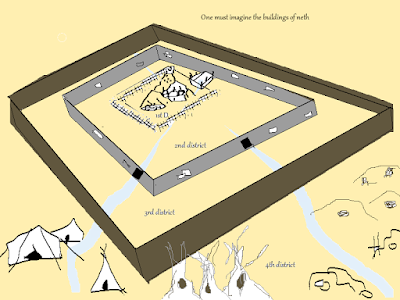 It also had a bit of a problem with a lack of overarching goal, but using a copper standard kept the players hella broke which was good, and the setting having things that individual characters could interact with helped players set goals of their own, like rehydrate the Dry City or marry a banjo playing giant spider or investigating the weekly Moon-caused disasters. 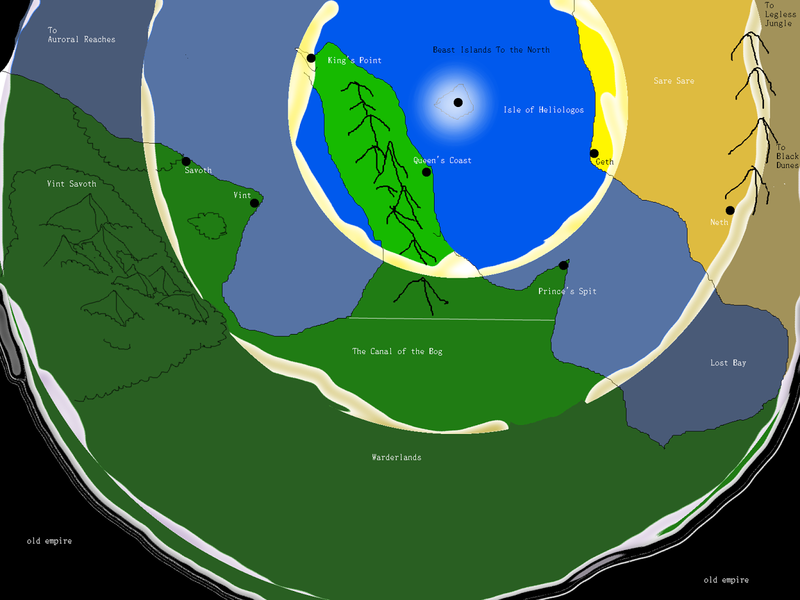 The 'void' beyond known lands can't be connected to known events until it is filled. I never did have a good idea of what was going on with that ocean isthmus Limedike was built on, and without rumors of 'what lies beyond' there was the impression there WAS nothing beyond. The Moon world has been my favorite so far and I will certainly return there, perhaps once the current campaign wraps up. 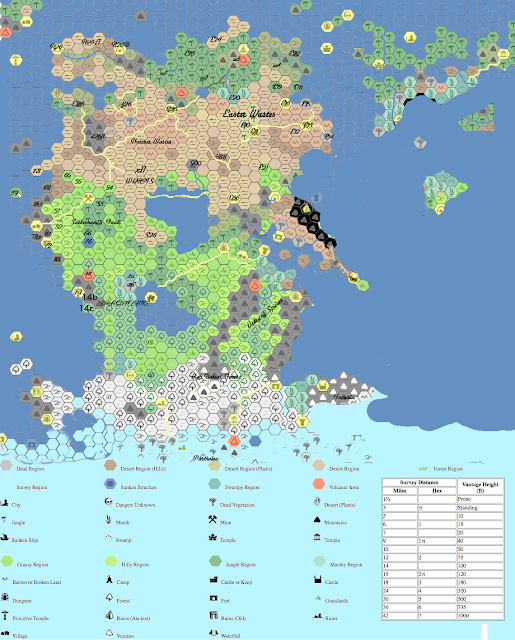 This campaign has the meta-structure of Sarkomand's Fault (BFRPG, a megadungeon beneath town, some lost artifact macguffins to find or ignore, lots of ruins and wilderness), the civilization of Wolf Moons (a main town and various small but noteworthy settlements) with the scale of Moon Rats (small starting area with dense distribution of points of interest) and a combination of self-authored, randomly generated, blatantly stolen, and player-authored content. 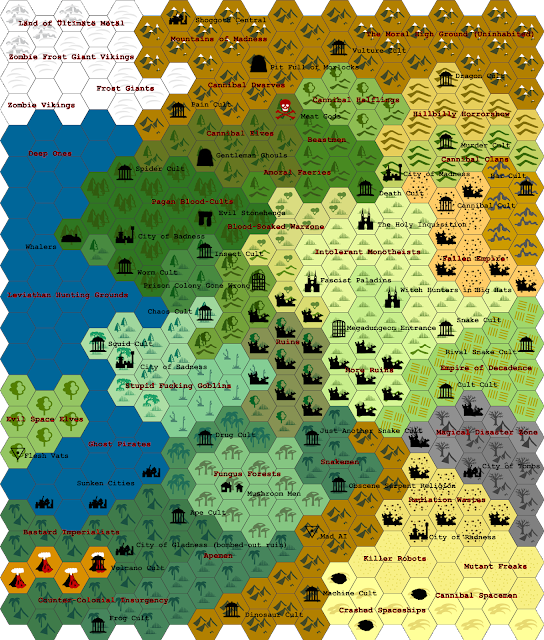 It's been a successful synthesis of some of the best parts of the past campaigns, though it's missing some of the per-campaign specifics that made those campaigns extra-special, and player-suggested content did a lot of work for me. There are some issues with player-suggested content that I've run into though. Players have different tastes among each other and unlike a GM, aren't necessarily thinking too hard about the ramifications of suggestions. Player suggestions quickly cemented this setting to be a nasty place. The dominant clergy are either corrupt bureaucrats, or two-faced soul-slaving demon-worshippers. There's a spreading Blight devouring the mainland, part zombie apocalypse, part black death, part grey-goo scenario. The Lord of Hate spreads enmity and suffering among men, and they to each other. The players are forced to react lest the lands fall to ruin, and yet they are but simple murderhobos, much daunted by the forces arrayed against them. Meanwhile posts the players wrote that were forces in favor of humanity were like, 'secret society of class-conscious robin hoods' which I liked, but wasn't the sort of thing to avert the coming doom, and these suggestions really succumbed to the first mentioned problem of players not being thrilled to investigate a secret society the players already knew about, even if the characters didn't. The 'unlikely heroes' narrative is not really what anyone was going for, and the player who suggested this gruesome blight to begin with hasn't been to a session in a long while, but the players left with that are acclimating to the constant turmoil... though I suspect the next event if they manage to stop the blight is going to be 'Civil War' so I'm half-prepping the next campaign or at least some islands for them to flee to in the event they're fed up with this setting hell-bent on becoming another ruined civilization for adventurers to loot in a hundred years. This experience hasn't turned me against player suggestions, far from it, but in the future I think I'd get all-player feedback about all suggestions before throwing them in to make sure there's not unexpected reactions in the setting stewpot that nobody much cared to deal with. Great post, it's interesting to hear someone's perspective that has this much world-building experience. With worlds used in actual play, even. This is exactly the kind of post I want to accompany world-building advice. Well done! 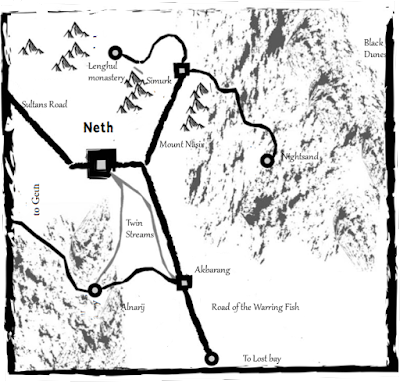 I actually took the Rat Moons map, rekeyed it, and used it for one of my campaigns. I fixed the "hey, what's over the ocean" problem by having this be the entire world: if you stand on the left side of the map and look over the ocean you can see the right side. Woah, nifty! I like the idea of a tiny world like that.